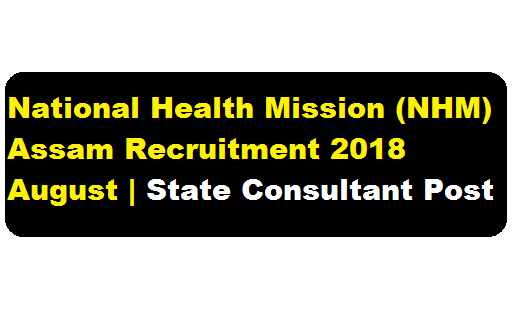 National Health Mission (NHM) Assam Recruitment 2018 August-September | State Consultant Positions : – National Health Mission Assam has published a recruitment notification for the month of September 2018 for filling up State Consultant positions. According to the latest NHM Assam Recruitment 2018 August, Online applications are invited from the candidates willing to work in mission mode with challenging tasks for engagement on contractual basis for the State Consultant positions under National Health Mission (NHM), Assam. Candidates have to apply online in the NHM, Assam website: https://nhm.assam.gov.in. In this section, we will discuss in detail about Recruitment of State Consultant posts under National Health Mission (NHM) Assam Recruitment 2018 August with all the details and requirement. a) Any Medical/ Public Health graduate can apply. b) At least 7 years (in case of Addl. Consultant, atleast 5 years) field experience in MCH program/ Project management at State / Regional level, with professional knowledge of Neonatal & Child health is essential. c) Post Graduate training in Paediatrics or Community Medicine/ Public Health is essential. Operationalization & monitoring of SNCU / NBSU / PICU, etc is essential. d) Familiarity with theory and practical applications and essentials of Child Health. e) Experience in planning and management of Health sector/RCH programs . f) Good negotiation and influencing skills supported by excellent communication skills. g) High level of computer proficiency with specific familiarity with commonly used Windows and MS Office software and database software . h) Excellent oral and written communication & presentation skills in English and Hindi. BRIEF DUTIES: He/She will be leading child health division under NHM with responsibility of overall design, planning and implementation of all child health activities under NHM, Assam & managing the Child Health team for planning and execution. Job will involve travel across the State of Assam and excellent exposure to various GOI Seminars and workshops. REMUNERATION: Negotiable for suitable candidates as per market rates & last drawn remuneration. In case of deputationists, the remuneration over and above the salary drawn can be paid on basis of experience and eligibility of the suitable candidate. Online application will be received till 3rd September 2018. Date of Publication of shortlisted candidates for interview 4th September 2018. Tentative date of interview will be 8th September 2018.
i) Only short listed candidates will be called for interview for which no TA/DA will be paid. ii) List of shortlisted candidates will be published in the website https://nhm.assam.gov.in before the interview. iii) No call letters will be sent for attending the interview. The non-Assam resident candidates will have the option for Skype Interview. iv) The undersigned reserves the right to reject any or all applications without assigning any reasons thereof. The details will be available in the website https://nhm.assam.gov.in. v) Relevant experienced persons currently working with Govt. of Assam are also encouraged to apply to work on deputation basis from various health institutions including medical colleges to NHM, Assam .